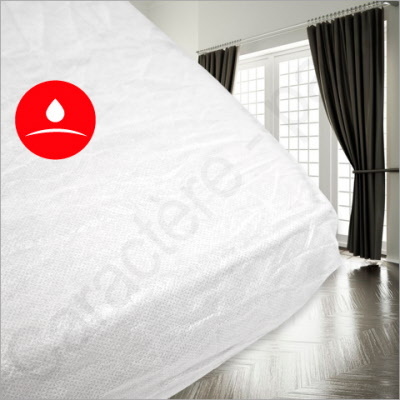 Perfect for hotels, motels, hostels, inns, B&Bs, day care centres, unexpected visits from friends, and now available in a special size for mobile homes or camper vans, our disposable, waterproof mattress protectors are made of a hypo-allergenic material which is effective at preventing the spread of lice, bed bugs, bacteria and dust mites in mattresses. This new material is soft and durable, and our fitted protectors in a wide range of sizes are very comfortable for your guests. The plastic film is melded to the fabric to protect against spills and stains by creating a waterproof layer, and after use can be thrown away or recycled. We also offer non-waterproof fitted sheets in the same dimensions and sizes, so if you don't need waterproof coverage please see our normal fitted sheet. 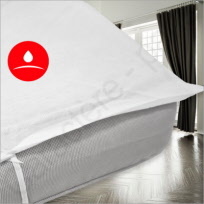 For an even more economical solution, please see the Pad Waterproof Mattress Protector.